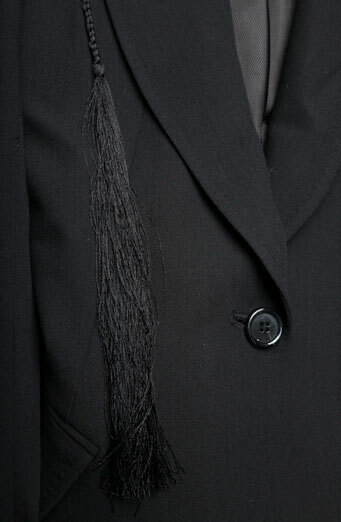 Back in Spring 2012 Ann Demeulemeester went a little tassel crazy. While I honestly have no desire to look like a lampshade or drapery (Carol Burnett's Went With The Wind anyone? ), I do think that this distilled version of it is totally beautiful and absolutely wearable. Granted, it's sold out everywhere but here, so obviously I'm a little late on this one. But doesn't it seem like we could just loop a beautiful long tassel through a buttonhole somewhere? Doesn't that seem like a wonderful idea? Barneys layered the blazer over some more tassels, and even though that's a lot of fringe, I actually think that works beautifully too. What do you think, will you add a tassel to your life? I LOVE tassels right now!